I just want to note this here about spectrums, after it came up on facebook. This spurred quite a lengthy conversation, after one of her friends took great issue with handling depressed individuals with kid gloves, among other things. I’ve just read about the dangers of handling people of any stripe with kid gloves (fascinating read; focused on college students, but I’m sure you can see the translation to nearly any population), which I saw the point of. However, I’ve also been depressed and had to weather the ceaseless “Why?” storm, so I let these two percolate in the back of my mind, as I do. For now, this is what I’ve concluded. Likewise, I think we’ve had the same thing happen with “depression”. Somehow, we’ve tacked depression onto the sadness spectrum, so “depression” has become “very sad” to many people. It is not. That said, since this is what’s embedded in our cultures, I think what happens is the automatic, unthinking response to the “I’m depressed” revelation has become “Why?” — because sadness has a cause, so therefore if you’re “very sad”, then that has a cause, too. You can’t afford to see a group you like in concert when they come through your town; etc. These are all causes of sadness, which will last for awhile, and then go away. Some will last longer than others; some will be felt more deeply than others; thus, sadness has a range, a spectrum. But instead of settling for “a little sad”, “moderately sad”, “really sad”, “deeply sad”, etc, we throw “depressed” in there, as though it belongs. It doesn’t. Anyone who’s had any kind of brush with depression (in whatever capacity) knows that depression is an entirely different beast than sadness. There often isn’t a why, or a straightforward why. It’s not the stuff for a casual conversation with your friend who’s only treating it as another verbal handshake1 — it’s the stuff for sussing out with someone who’s trained in depression. The healthy mind’s verbal handshake, or throwaway comment, is the remark that the depressed mind might obsess over for days. “Am I really depressed? Am I just using this as an excuse for being lazy? I don’t know why I’m depressed…” It’s perfectly normal to not know what tangled mess is going on that’s wrought the depression – it’s not something as simple as your puppy having died, or else that’d be sadness. 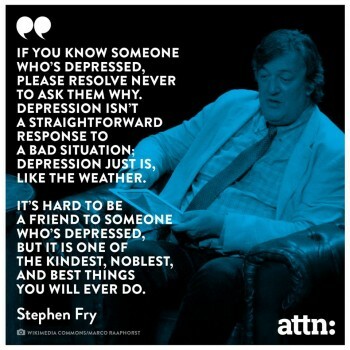 But the more we keep asking this ridiculous “Why?”, the more we keep alive the myth that it is something simple, that depression is a form of sadness — and the more we keep people from getting the help they need.